God’s people throughout the centuries have struggled to understand the relationship between God’s sovereignty and our human responsibility. Recently, some theologians have developed a theological framework most commonly referred to as “Open Theism,” in order explain the apparent paradox that exists between the twin realities of God’s divine rule and our human freedom. This framework was previously critiqued in an earlier book by Bruce Ware entitled, God’s Lesser Glory, in which the title of the book foreshadowed Ware’s conclusion of Open Theism: it is a theological framework where “God’s glory is cheapened and diminished” (9). The view presented in the present volume (God’s Greater Glory), is, according to Ware, a vision of God in which his glory is “honored and exalted” (9). Whereas God’s Lesser Glory was written as a critique of Open Theism, God’s Greater Glory is written as a positive affirmation of God’s sovereignty as revealed in Scripture. That is not to say that Ware refrains from critically assessing the tenants of Open Theism in this present volume—in certain places this is necessary—but instead of narrowing in on the negative elements of Open Theism primarily, Ware’s main thrust of God’s Greater Glory is to present a glorious, satisfying, historically faithful and Biblically consistent vision of the sovereign God of the Bible. In order to properly introduce the subject of God’s sovereignty, Ware posits seven questions that bring into focus the fundamental importance of rightly understanding God’s providence. These questions, however, are not original with Ware; they are questions that have been asked by each generation, as God’s people have sought to bring clarity to their vision of the Almighty. Questions range from, “What is the relation of divine providence,” to, “What is the relation of divine providence to salvation?” Following these questions, Ware then establishes a number of “necessary features” (23) that must be included in a “responsible biblical model of divine providence” (23). After this concise and helpful introduction, Ware unfolds this “responsible biblical model of divine providence” in two parts. Part one establishes and examines the theological and biblical foundations for understanding God’s providence over all creation. In this section, Ware interacts with both Scripture and Christian theologians in order to bring the reader to the conclusion that God not only rules all creation exhaustively and meticulously in view of his own divine purposes; his providence is fully compatible with human freedom. (Ware notes, however, that Scripture does not support the idea of libertarian freedom—the notion that true freedom lies in the ability of the moral creature to, “at any moment…choose one thing or another” (66)—instead, Scripture teaches that true freedom is found the ability to do what one most wants to do. Human freedom is “Freedom of inclination” (79)). Ware then closes this section with a stirring reminder that God’s Word, from Genesis to Revelation, while maintaining the doctrine of God’s exhaustive and meticulous sovereignty, concurrently upholds the breathtaking truth that “the greatest value in the universe, and the final end of all of life, is the uncontested supremacy and unrivaled glory of God alone” (159). To dilute the doctrine of God’s sovereignty is, like we have already stated, to diminish this glory in the church and in the world. In part two, Ware investigates the practical implications of God’s providence in the specific areas of suffering, prayer and Christian service. In each, Ware gives, in my opinion, invaluable instruction from God’s Word as to how we should approach each of these vital aspects of the Christian life. Ware closes his treatise with an exhortation to recapture this glorious vision of God’s sovereignty in the church. Pastors and teachers—those who have been entrusted with the Great Deposit—must especially labor to provide their people with vision of God’s sovereignty that is “true and glorifying to majesty” (211). 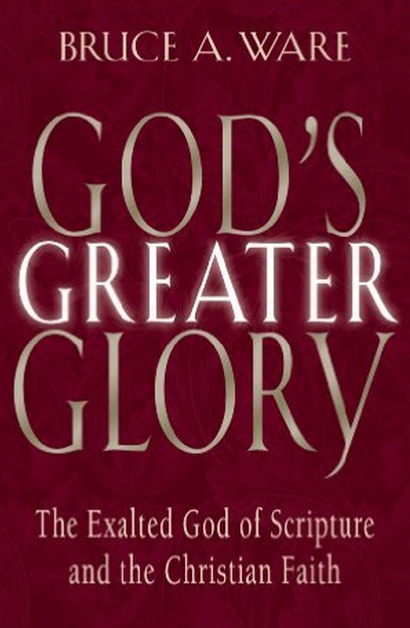 In my judgment, what brings spiritual power and persuasiveness to this book is Ware’s passion for the vision of God he presents in God’s Greater Glory. One of the most edifying portions of the book (and that is a difficult distinction to make, to be sure!) is the preface where he explains why he has written this book. He is not driven by the desire to win an argument or feed personal ego—the stakes are infinitely higher than that. Ware writes, “If we are to escape the cult of self and find, instead, the true meaning of life and the path of true satisfaction, if we are to give God the glory rightly and exclusively owed to him…we must behold God for who he is” (9). Ware is far from a cool, dispassionate, detached academician. His rigorous interaction with the subject matter is coupled throughout with heart-felt adoration of the sovereign God of Scripture. The reader is given a taste of the practical implications that Ware’s vision will have on personal worship on page 158: “…worship happens only when we are granted eyes to behold God’s magnificence, and splendor, and glory and majesty. This is a seeing with deep and abiding longing, a seeing that savors, eliciting a savoring that satisfies.” Ware is passionately and personally engaged with the issue of God’s sovereignty and thus his work is both accessible and beneficial for all of God’s people, scholar and layperson alike. Another notable strength is Ware’s treatment of practical issues directly impacted by a study of God’s sovereignty: suffering, prayer and service. Ware’s discussion of suffering is especially clear, balanced, biblically saturated, and deeply encouraging. Yet, although Ware approaches and seeks to understand the issue of suffering in light Scripture, he does not attempt to speak where God has not spoken. Perhaps one of the most important sentences in the book is Ware’s observation that our lives are often marked by befuddlement. He writes, “How much of life, our life, is like this: we simply don’t know. In our experiences of suffering and affliction, we are often in the position of Job was in, where we don’t even know that we don’t know, and we certainly don’t know what the bigger picture is that would explain and make sense of our confusion and bewilderment” (163). At the same time, however, and as we see in the life of Job, it is through the crucible of suffering that our beliefs about God’s Providence are brought to the surface of our lives. A sincere and engaged reading and embracing of what Ware writes in this section will enable us, I believe, to respond to trials with the posture of Job, saying, “The Lord gives and the Lord takes away, blessed by the name of the Lord” (Job 1:21). I have profited tremendously from Ware’s heart-felt and theologically rigorous treatment of the age-old questions relating to God’s providence over all creation. I commend this book to you for your growth and edification, and I pray that God would enable us to live in light of these glorious truths.